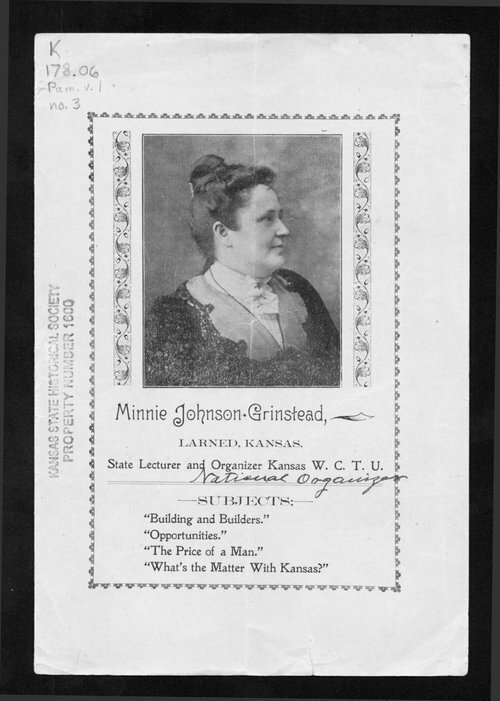 A pamphlet promoting Minnie Johnson Grinstead of Larned, Kansas, who was a state lecturer and organizer of the National and Kansas Women's Christian Temperance Union. It contains personal testimonials and quotes from the press praising her speaking abilities. In addition to her Women's Christian Temperance Union work, she was the first woman legislator in the Kansas House of Representatives. Grinstead, a Republican from Seward County, Kansas, District 123, served in the House from 1919-1923. She was born in Crawford County and graduated from the State Normal at Emporia. Grinstead was married to Judge Virgil H. Grinstead.